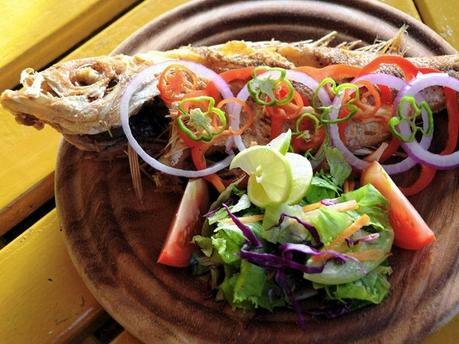 The Escovitch Fish Recipe is a traditional Jamaican dish. It is first fried and then covered with a spicy sauce that preserves it. When people did not have electricity, it was one of the most famous dishes to be prepared; as it could be left out for a day or two without spoiling. It is a popular Good Friday menu favorite as well. Make diagonal slashes in fish. Season with port royal fish frye, salt, black pepper and ground pimento. If using whole fish, rub the mixture inside the fish itself. If using sliced fish, rub the mixture over each slice. Sprinkle the fish with the seasoned flour, and deep fry in hot oil until golden brown. Place all the ingredients for the escovitch sauce in a pot, and bring to a boil. Boil for about half a minute so vegetables do not loose their crunch. Serve with bammy, festival, Johnny cakes or bread.